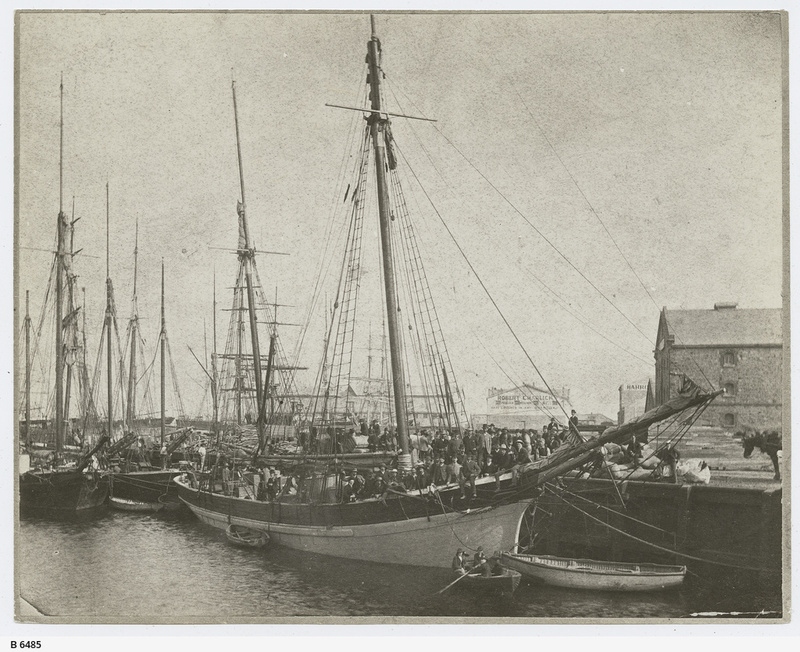 [General description] Sailing ships moored at a Port Adelaide wharf. The deck of the ketch in the foreground is crowded with men from the surveying expedition mentioned below. Warehouses can be seen in the background including one with the name Robert Charlick, feed merchant. [On back of photograph] 'S.A. Company's Basin, Pt. Adelaide / From the bridge at the entrance of the basin / A ketch leaving for Arno Bay with surveyors / June 24, 1877 / . Party members: W.C. Gosse, J.C. Hawker, W. Clindening, Chas. Wells, H. Melville, L.C.E. Gee, G.E.H. Ayliffe, Louis Farr, - Kershaw'. Information supplied by a researcher: There are two references to this trip on 'Trove': 'The Express and Telegraph' (Adelaide), Thurday 26 July 1877, page 2; and 'The Register', Tuesday 12 February 1924, page 12. Looking at these references and the sailing reports at the end of July, it seems pretty clear that the newspaper reports cited confused the 'Euro' with the 'Royal Shepherd'. The former was making the Moonta and Port Pirie runs during this period, and the latter the Port Lincoln run: left Adelaide on Tuesday, 24 July, as the reports claim (the 'Euro' left for Port Pirie on the Wednesday), arrived Arno Bay on 27 July and was back in Adelaide on 29 July. She left again for Port Lincoln on 1 August, so was making the regular Port Lincoln run, whilst the 'Euro' made the regular Port Pirie run.